Your Beauty Concern Solved: How Do I make my eyes stand out when wearing glasses? How can I make my eyes stand out when I wear glasses? For those that wear glasses it can be difficult sometimes for people to see past the glasses to the pretty eyes behind. There are a few simple steps that can be done to lessen the effect of glasses. Firstly try to get as small, streamlined pair of spectacles as possible. There are many shapes and sizes available in shops like Specsavers now that almost minimise the idea that youre wearing glasses at all. 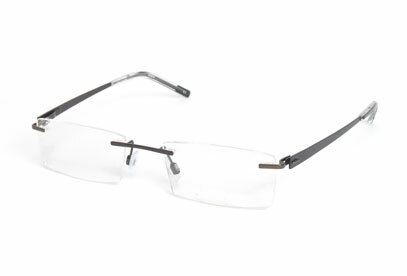 The model above is the rimless 117 design available on the website. As you can see the lenses are pretty much transparent, and only the arms are visible. Once you’ve decided on the right glasses the next step is to experiement with your makeup to make your eyes stand otu as much as possible behind your spectacles. Many people believe you should match your eyeshadow to your eye colour but this is a common misconception. For your eyes to really stand out there needs to be a contrast of colours to make your eyes ‘pop’. You should finish your eyeshadow off with a glittery eyeliner that slightly contrasts with the eyeshadow you applied. For example with pink eyeshadow try a sparkly purple, the juxtaposition of colours will attract attention to eye area in a good way. Try to keep the rest of your makeup as natural as possible; neutral foundation, lips and a warm blush colour. That way people’s eyes will be drawn instantly to your eye area but they will no longer be looking at your glasses, they’ll be seeing how pretty your eyes are for the first time. If you have any questions about this beauty tutorial or you want your beauty concern answered please email me at kathycakebread (@) gmail.com and I’ll try to help asap. "Create the perfect summer hair"